Rollerball There are 9 products. Rollerball pens are prized for their smooth flow and rich, vibrant ink, making these custom-branded Rollerball pens from Sutter’s Mill Specialties the ideal promotional gift or giveaway. Available in a variety of styles and colors, including sleek carbon fiber and sturdy brass, these personalized pens proudly feature your brand and logo laser-engraved on the barrel, creating a writing tool guaranteed to get noticed and admired. This sleek Rollerball pen was designed for optimal writing comfort, and has powerful carbon fiber embedded in the barrel. Available in gleaming silver or rich black. 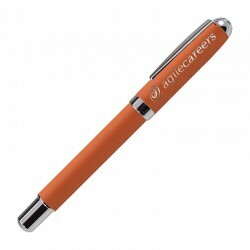 This executive promotional pen is truly unforgettable, with an elegant design, brilliant available colors, and a high-strength carbon fiber barrel. This beautiful Rollerball pen has a simple yet elegant design, with a bold matte finish, stunning available colors, and chrome accents. Take advantage of an incredible low price! 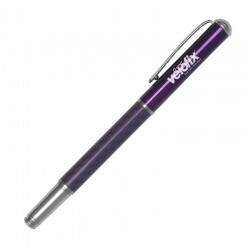 This executive promotional pen is truly unforgettable, with an elegant design and a high-strength carbon fiber barrel. This sleek executive pen features crisp, clean lines and styling with a brushed chrome finish. Lightweight and finely crafted, this pen has silvery accents and a charcoal satin-plated finish. This sleek and colorful Rollerball pen was designed for optimal writing comfort, and has powerful carbon fiber embedded in the barrel. This beautiful Rollerball pen has a simple yet elegant design, with a bold matte finish, stunning available colors, and chrome accents. This sleek and colorful Rollerball pen was designed for optimal writing comfort, and has powerful carbon fiber embedded in the barrel. Now available for an incredible low price!